Kim Lindgren has a McS in Biology, has previously worked as a field assistant for Skellefteå municipality and is a proficient computer programmer. Kim works at both Röbäcksdalen and Svartberget since two years and is the initiator of TagTags, the digital field sheet used within SITES. How is it to work at two field research stations at the same time? For me personally, I think the biggest advantage is the bigger support network, there is nearly always someone I can ask if I have a question or if there is something I need for my work. Furthermore, the communities at both stations are great and I enjoy working with each and every one. For the stations, the biggest advantage is of course the sharing of knowledge and experience. In many cases, both stations have similar problems and we can develop a solution together instead of wasting resources and creating two separate systems. One example is for sample storage, currently I am working on a sample storage system which should help keep things organized. The project was started at Röbäcksdalen but will definitively be of great use at Svartberget as well, and could hopefully be adopted by other stations! The only negative aspect of working at two stations that I can think of is that it becomes slightly harder to plan my vacation! Kim sampling for SITES Water in Degernäs creek at Röbäcksdalen. Photo by Tommy Andersson. Are there similarities and differences between the stations you work at? I think the biggest difference between the stations is that Svartberget is part of a support unit, while Röbäcksdalen is governed by a department. Essentially, this means that Svartberget is inherently more focused on infrastructure while Röbäcksdalen has a comparatively greater history on meeting demands from the researchers at its department. Since SITES initiation great efforts has been put into equalizing this trend and open up for increased usage from a larger range of ecosystem research. Furthermore, a definite difference between the stations is that Svartberget already has a lot of infrastructure so that, for me, the work is mostly focused on managing the data from these infrastructures, while Röbäcksdalen is in an exciting expansion stage where I get to be a part of developing and governing how data collection should happen from the ground up. As for similarities, the stations are both very well established within their fields and have very competent staff and a rich and interesting history. Both have very long data-series and experiments which have been running for decades which I think is very important to highlight and preserve! Summer fields at Röbäcksdalen. Photo by Lim Lindgren. What is your background and how does it influence your work today? Since I was quite young, I have wanted to be a scientist and an inventor, which put me on track to pursue a career in the academic world. I have always been very broad in my interests, but with a definite focus on science and technology. While I was still in high school I found Linux and the open source movement, which spurred on my interest in programming and fueled my interest in open-access data and transparency within the information industry. Furthermore, I have been politically involved for a long time and for a while I was the head of the local section of a youth party in Skellefteå, where we lobbied for democracy and equal rights as well as against racism. This has definitively had an effect on my work since I always strive to achieve the highest possible level of transparency in any system I develop. Furthermore, I believe the public sector should embrace open source solutions and open standards to a larger extent. Beyond this, I have always had a big interest in nature and biology, which led me to take a masters degree in evolutionary ecology. Specifically, I am very interested in how climate change drives selection in plants. I think that this field fits me perfectly since, at least in my opinion, it embraces computational technology to a large extent. This has also definitively affected my work, since I believe it puts me in a relatively unique position of being a developer that understands the needs and thinking of researchers and field technicians. Furthermore, I still have an interest in doing research on evolution and population genetics and perhaps doing a PhD at some point, but in the end my greatest interest rests with the technical aspect of science. TagTags used in field, pictures from the instruction video. Your initiative TagTag has spread across the SITES stations, tell us about the idea and the current status. I had the idea for an app TagTags several years ago, since I thought that the increased availability of easily portable but still powerful devices like tablets and smartphones could reduce the problem of lost papers and unreadable handwriting, not to mention the hassle of going through historical data which had never been digitized. Eventually, I contacted the Krycklan project and asked if they had any interest in me coming in and working on it, and as it turned out they had already been looking into this type of solution but did not have the time nor experience needed to pursue it. At first we looked at a few alternatives that already existed, but found that they were all either too limited or too complicated for an average user to configure, so I drew up the concept for TagTags and showed it to Peder Blomkvist, who really liked the idea. Initially, I worked on TagTags in my spare time in parallel with another app we were trying at the time, and when it reached a stage when I thought it looked good enough, I showed it to Peder and Hjalmar Laudon and the decision was made to drop the other efforts and instead continue development of TagTags. At the time, I never imagined that it would grow as much as it has now. As for the situation today, I have begun working on TagTags 2.0 in my spare time, which will expand on the concept further, address some of the problems it currently has and introduce a few requested features as well as some really neat and useful new features! 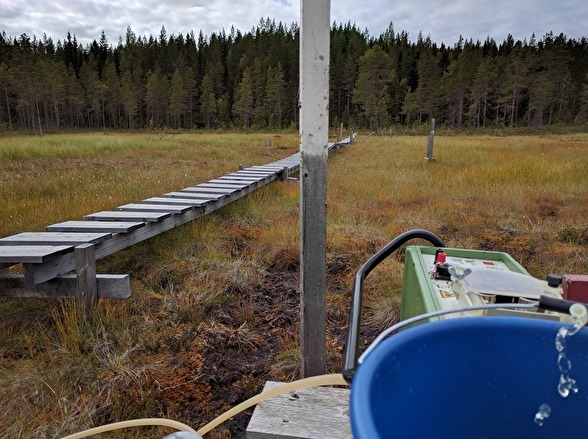 Water sampling from the Kallkälls mire at Svartberget. Photo by Kim Lindgren. The other station that I have had the most contact with is probably Skogaryd, which was one of the early adopters of TagTags. 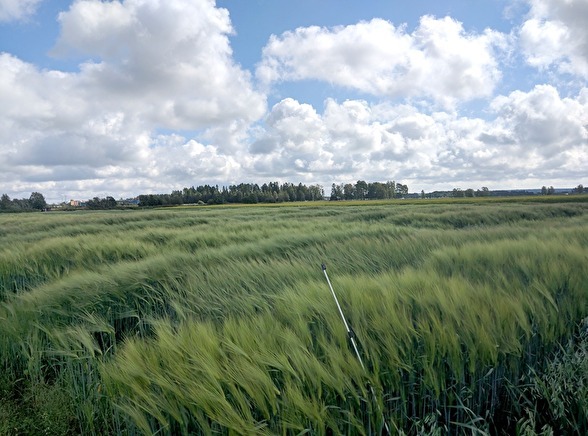 However, I have also been in contact with Lönnstorp, where we have been discussing data management strategies and shared knowledge and contacts regarding installations for SITES Spectral at the two agricultural stations. Furthermore, we had a TagTags-workshop in Stockholm last December, where I believe all stations were represented. During the workshop it was fun to meet representatives from more stations and get some broader feedback on the app, as well as learn more about the activities within SITES directly from the people involved. Overall, I think that SITES is excellent in promoting sharing of knowledge and competence, and that it is probably the greatest benefit of taking part in the infrastructure! Looking ahead, what you want to learn more about and develop in SITES? Overall, one of the things I would like to see happen in the future is better and more collaboration/exchange between organizations, not only universities but also municipalities and county boards for example. 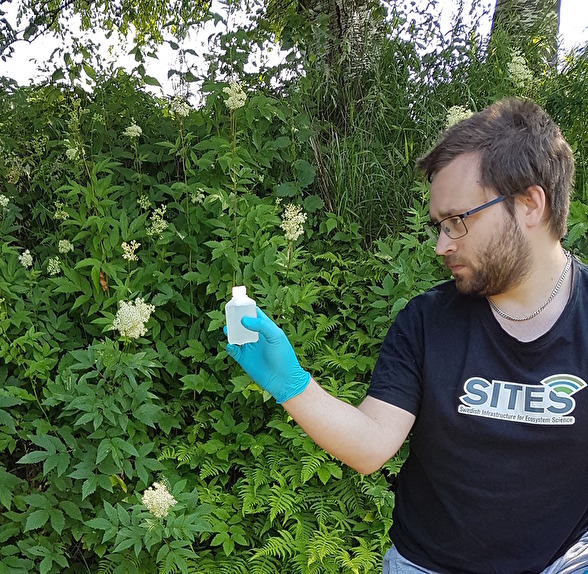 SITES is good at managing data from measurement programs and keeping track of sampling procedures, and if SITES could become a national coordinator for all ecosystem monitoring in Sweden (or maybe even Europe?!) and organize data from all of these initiatives, I think that would be of awesome benefit for all of society. Furthermore, I would love to see SITES grow to include organizations that are seated outside of Sweden as well! Whatever happens in the future, I hope I will get the opportunity to take part in shaping it.